Air plants get all of their nutrients from the air but they do still require an occasional watering. Here are some helpful tips to keep your air plant thriving. Light: Bright, indirect light is best. Watering: There are several different ways to water an air plant, spray/spritz, run under the sink for 5-10 seconds and the soak method. And how much watering your air plant needs can vary on the humditiy of your home or office and where it’s place. For example, you may need to water more frequently if it’s close to a window and/or air vent. Or, you may need to water less frequently if your plant is in a bathroom. My recommended method: Soaking. 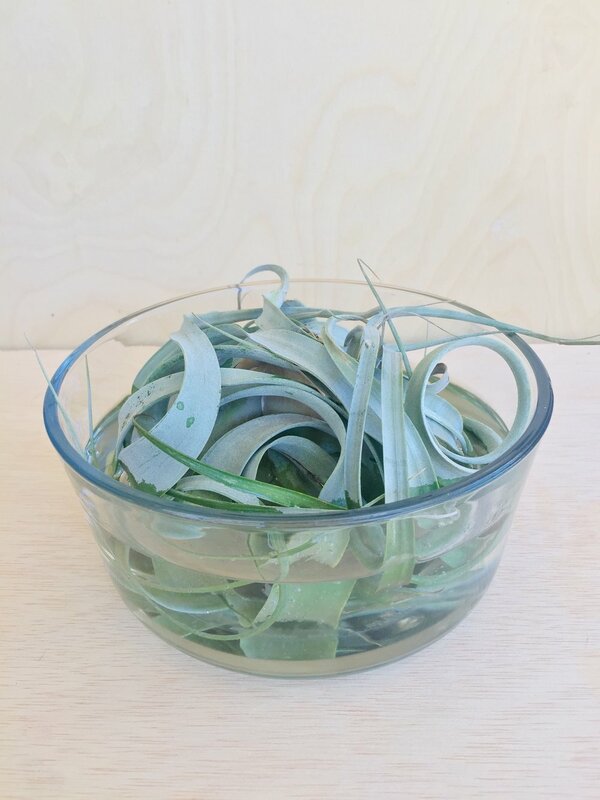 About once a week or so, soak plant(s) in a bowl/cup of water for about 20-30 minutes. I soak mine upside down and leave the bottom, bulb like part, out of the water. This helps the base from getting oversaturated with water which can cause rot. Remove from bath and shake upside down for a second or two. Allow to dry completely, upside down is best, for a few hours before placing plant back in its haven. I place mine on a cooling rack or dish strainer upside down to dry. Temperature: They like to stay at a cozy 60-90 degrees.